With Predator 2 and all its many cool features, we have also included an ‘Easy Page’ for the users that don’t like too many controls. The ‘Easy Page’ offers you the most important parameters if you want to change a sound quickly or just want to use the handy ‘preset variation’ function, which is an intelligent randomizer. Predator 2 is packed with new powerful features such as: ‘Waveform morphing’, ‘Waveform drawing’, “WaveSet playmode’, XY pad, new EQ, and new voice level distortion.... and so much more! 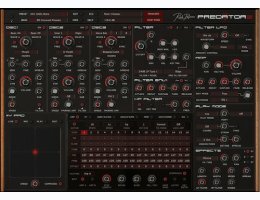 Shipped with inspirational presets, Predator 2 is a unique synthesizer concept which combines ‘User Friendliness’ and ‘Packed Features’ in one amazing product. Each preset can hold up to 8 user waves, which can be combined into wave-sets, which can be traversed in different ways. Each user wave is editable, using up to 256 partials, and with advanced commands to edit & shape these wavetables. Included with Predator 2 are many wave-tables and wave-sets.